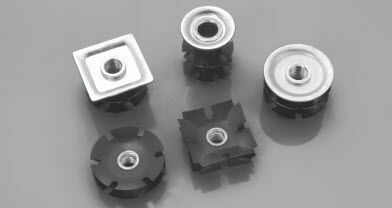 In the wide range of fasteners offered by Fixi, you can now find inserts for round and square tubes. The tube inserts in the Fixi range are designed to solve issues related to the forming of threaded holes inside tubes by replacing the traditional process of welding nuts inside tubes yet providing a secure and tight fitting. Made of special Steel, Fixi tube inserts guarantee high tensile strengths after application thanks to the anchoring function of the elastic crowns which expand once inside the tube, without altering the shape and design of the tube. The easy and quick fitting by pressure installation both manually or with automated machines is one the strengths of these inserts. 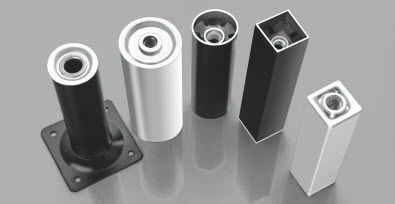 The range of inserts is available in different sizes to fit all types of tubes, ranging from 11.8mm to 61.5mm for inside diameters of round tubes and from 15.7x15.7mm to 48.8x48.8mm for inside dimensions of square tubes. The thread sizes range from M6 to M10, sufficient for any structural requirement. For both round and square tubes the insert is available with our without head. The flanged version in addition to having an aesthetic function by closing the end of the tube, allows the insert to work even under pressure, so it’s ideal for applications on table and chair legs. There is also a special version of a simple to fit flanged insert for swivel wheels.